Hello Alan. Thank you for your request. There are a couple of options open to you which I will outline below. This is quite easy to do on a PC. Simply pop open the chassis and remove the CMOS battery (as pictured above) from its place on the motherboard. 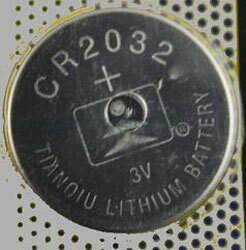 You will recognise it because it is quite big, silver, and usually has the words Lithium Battery CR2032 written on it. Be careful when removing the battery. They are usually fit quite tight into their place holder and sometimes held in place by a little metal bar. Leave the battery removed for a couple of minutes or so. While your computer is switched off the CMOS memory is wiped, which also removes the password. However, be careful using this method as it also resets all of your BIOS settings to factory standard. If you have changed any other BIOS settings, you will need to change them again once you put the battery back in and close your PC back up. For Laptops, however, this option can be a little tricky to do. Often you cannot gain access to the battery. Laptops can also have a security chip on the motherboard which you would have to remove. I don't recommend this option. Most PC motherboards have a jumper that clears BIOS passwords and settings. The location of the jumper really depends on the motherboard. Check your computer manual or look on the motherboard itself for the label. 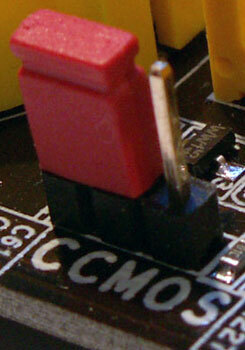 The label, printed on the motherboard, usually says something like CMOS, CLEAR or CLR (As the image above shows). The jumper is sat on 3 pins, either centre-left (as the image above shows) or centre-right. To reset the BIOS, ensure your PC is switched off, then move the jumper to the opposite pin. For example, the jumper in the image above would be moved to centre-right. Leave it there for a few seconds, then move it back to it's original position (centre-left in this example). Switch your PC back on and your BIOS password should be removed. There are BIOS/CMOS Password Recovery tools available cross the Internet (Some you need to pay for) that will work immediately to remove your forgotten password. If you search for BIOS Password Recovery Tool a lot of results come back. Sony and other manufacturers usually have a master BIOS password that overrides anything you set up. These master passwords are hard coded into the BIOS programming which protects them from anything you might do. You can contact your Computer/Laptop manufacturer and ask them for the master password. some will give you it, others will charge for the privilege. Again a lot of these master passwords are published on blogs and other web sites. Simply searching for them and there is a good chance you will find the password you are looking for. Alan: this is another option open to you. I hope this is of help to you Alan, and anyone else reading this page. If you have any queries please go to my Get In Touch page (link at the bottom of every page) and ask away. this is old method usable only for lowend computers ? Join in and write your own page! It's easy to do. How? Simply click here to return to American Megatrends BIOS.